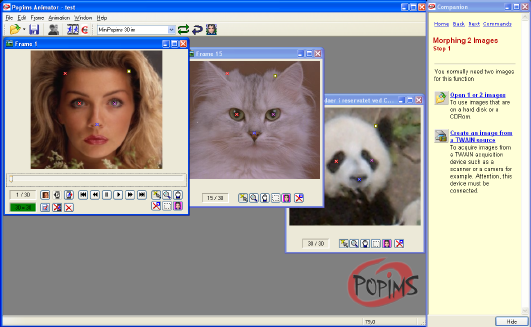 Popims Animator is a free software to create Morphs, Warps and other effects with one or more pictures. With the help of this software you can resize, crop and align the pictures to get the best morphing results. So when you select multiple images and create the animation it is displayed on the screen and the output can be saved in a variety of formats. Popims Animator can read and write JPEG, PNG, BMP, WMF, EMF, GIF and PCX Images. It supports TWAIN compatible cameras and scanners. Popims Animator can automatically resize, align and crop the source images for optimal morphing quality. The resulting output morphs can be saved in AVI or GIF format. You can also save it as a BMP, PNG, JPEG sequence.